We believe that through collaboration and doing things differently we can achieve the ultimate result. Guapa is the most customer friendly Magento partner. As a part of the English listed billion dollar company Wolseley Soak.nl is a relatively young company. If you take a closer look at their ambitions, you wouldn’t say so. A solid e-commerce platform will be the basis for their enormous growth ambitions. Their own assortment, multiple (own) brands in multiple countries, big on- and offline media campaigns and they are building their own distribution centre. These are some of the examples of their ambitions. Haven’t heard of Soak? This will change for sure. Soak does not exist for a long time but they have started with huge ambitions. The first talks between Soak and Guapa took place in 2015 and where part of a thorough search for a platform that could realize the boundless ambitions of this newcomer. Soak deliberately chose for the platform and the partner with whom the platform would be build. Together with Magento we convinced Soak of the benefits Magento has to offer along with the expertise of an Enterprise Partner. A new office in Deventer (NL), a lot of new employees, buying the assortment in China and building a quite substantial Magento Enterprise platform meanwhile, if you ask us this is quite the challenge which they handled perfectly at Soak. Soak wanted a platform for growth Start of with earning money and then refine the technique. That was the core of the question that Soak asked us. Go live as soon as possible with a minimum viable product and then continue developing the platform to stay ahead of the growth. Magento Enterprise best suited the wishes and demands of Soak. After an intensive collaboration with an external partner for the design and the European positioning of the brand they chose a brand made by the English parent company and made the design themselves. 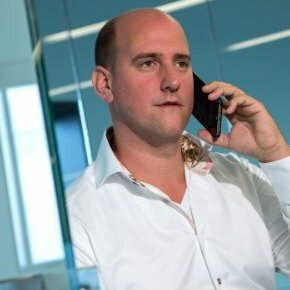 Speed and scalability Soak is a pure online player that did not have a webshop for the Dutch market. To cope with the ambitions, the corresponding number of visitors and the considerable growth we chose for a fast and scalable setup with Magento Enterprise 2 and a solid hosting platform. In this case we chose for Amazon cloud hosting at technology partner Rackspace. Integrations and customization Magento 2 is very suitable for integrations with external software. 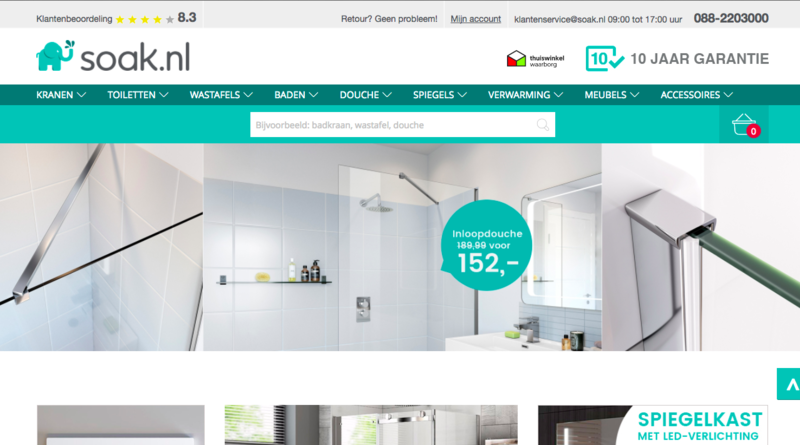 In our Soak case we integrated their Magento platform with Mailplus and RobinHQ. Right now we are building integrations with their DC, PIM and ERP software. Overall the Soak platform has a lot of customization and we will continue to add new custom features during our long term collaboration. Roadmap and growth The roadmap of Magento fits the growth strategy of Soak and the collaboration with Guapa B.V. perfectly. If you look at the needs and requirements Soak has Magento completes the puzzle in combination with the custom features Enterprise Partner Guapa B.V. is developing. 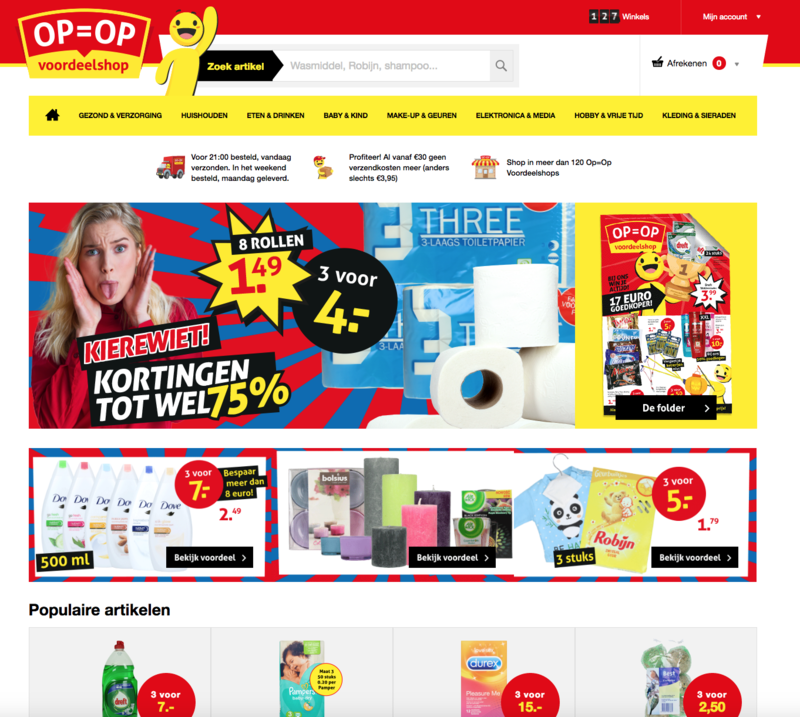 Op=Op Voordeelshop is a specialist in the field of personal care, household products and health articles. They have an omni-channel vision and next to the new Magento Enterprise 2 platform they have 126 physical stores in the Netherlands. This makes them one of the biggest players in the business. An e-commerce platform to strengthen the online growth. Op=Op started with physical shops in 1997 in multiple shopping areas in the Netherlands. In 2015 they opened their 100th shop and they keep on opening new stores. Right now (Nov. 2016) there are 126 stores across the Netherlands. In 2015 the plans for building a brand new e-commerce platform started. These plans fit perfectly in the growth vision of the company.Namely: growing to an order average of more than 2000 orders per week. The choice for Magento was easy and after some talks with official Magento partners Guapa B.V. was chosen because of their down-to-earth approach. A considerable budget was reserved to be able to invest in e-commerce. The e-commerce budget should have a great positive contribution to the growth of the entire company. There was no doubt in starting with the Magento Enterprise edition and therefore immediately on the new Magento 2 platform. The e-commerce platform needed to provide in scalability, speed and personalization. Therefore the choice for Magento Enterprise was made very quickly and with an investment of this size Magento 2 was the right choice to earn it back. “Working with Guapa and Magento on our mutual growth and strong roadmap ” Dion Fokkema - Ecommerce Manager Op = Op voordeelshop. The basis is overcomplete Magento 2 delivers a complete set of features out-of-the-box and therefore Op=Op made the choice for Magento. Because there were a lot of custom features needed to get the platform to the level that Op=Op desired we also chose Magento. Because Magento 2 is open-source and they have chosen a structure that makes it relatively easier to add customization and custom features along with your Magento partner, it was the best choice instead of the first edition of Magento. Speed and scalability Op = Op Voordeelshop had an old basic website which gained a lot of visitors before their Magento webshop. To cope with this amount of visitors and the predicted growth we chose a fast and scalable setup with Magento 2 Enterprise and a solid hosting platform at Technology partner Byte called Hypernode. With Hypernode you get extra options in your admin panel for speed and scalability which help you in your flexibility. They also have extra options for the Enterprise customers and these advantages made it an easy choice. Integrations and customization Magento 2 is very suitable for integrations with external software, and we provided multiple integrations for this Op=Op case. At this moment there are integrations with Sherpaan, Beeyond PIM and PostNL. Next to that the shop is loaded with customizations and we will only add more unique and groundbreaking features. Roadmap and growth The roadmap of Magento fits the growth strategy of Op=Op and the collaboration with Guapa B.V. perfectly. If you look at the needs and requirements Op=Op has Magento completes the puzzle in combination with the custom features Enterprise Partner Guapa B.V. is developing.